From frozen ponds to Madison Square Garden, ice skating has become a quintessentially New York pastime, woven into the city’s urban fabric in ways large and small. New York on Ice: Skating in the City invites visitors to explore how ice skating evolved in the city from its colonial Dutch and British origins to become a 19th century craze, and later an opportunity for elaborate spectacle, commercialized leisure, and competitive sport in the 20th century and beyond. Along the way, skating has left its mark on New York’s urban landscape, from the design of Central Park, to intimate hotel rinks and extravagant arenas, to a plethora of skating facilities that today define and transform parks and other public spaces across the city. 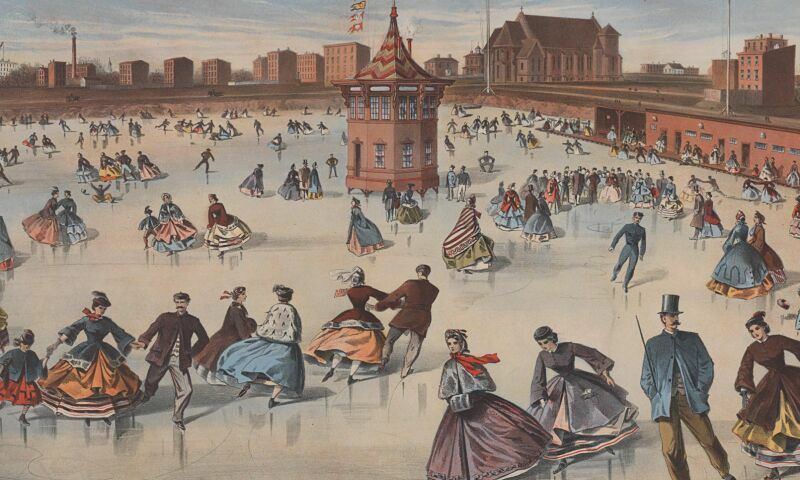 The story of New York on Ice will be told through vintage photographs, posters, lithographs, paintings, and costumes. Together they reveal the evolution of the sport and art of ice skating in the city both as a window into a passion and pastime of generations of New Yorkers, and as an unexpected ingredient of urban place-making.